Sandra Ridley grew up in Saskatchewan and currently resides in Ottawa, Ontario, where she facilitates poetry workshops at Carleton University, the Tree Reading Series, the Ottawa Public Library, and the City of Ottawa. Her first book of poetry, Fallout, was a finalist for the 2011 Ottawa Book Award and won the 2010 Saskatchewan Book Award for Publishing. Her second book Post-Apothecary was a finalist for the ReLit and Archibald Lampman Awards. Whether addressing subjects such as devastation from the nuclear age or an abandoned TB sanitarium, Ridley means business, and her fierce application of lyrical craft and formal innovation to her subject render all of her books as stirringly evocative and cohesive works. 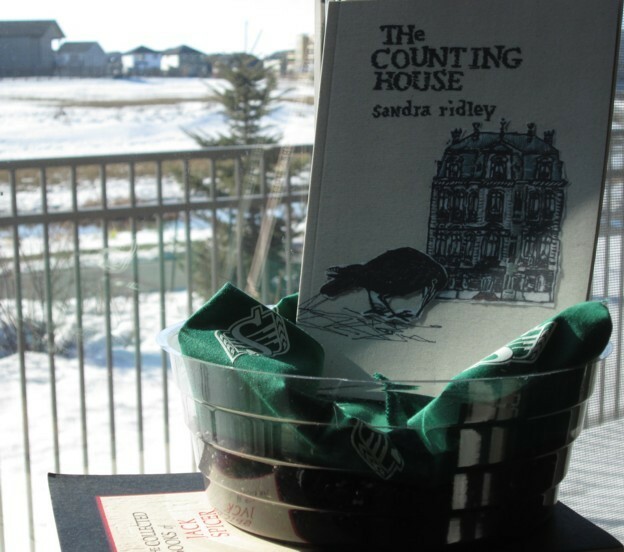 Her most recent collection The Counting House is no exception, riffing on a nursery rhyme that already houses a dark admonition. Ridley’s forensic account of the highs and downturns that touch the erratic realm of courtly affection casts a fascinating shadow over not only our domestic power struggles but also our own contemporary value systems, leading us to wonder whether through our relationships, aspirations, and avid consumption, we are perhaps only crowing to spite our face. Ridley wrote part of the book called “Lax Tabulation” as an ekphrasic response to Michèle Provost’s art installation, “ABSTrACTS/RéSuMÉs: An Exercise in Poetry”, which was exhibited in 2010 at the Ottawa Art Gallery, including responses by other highly notable Ottawa-area writers jwcurry, Pearl Pirie, Carmel Purkis, Grant Wilkins, and the inimitable John Lavery, one of Canada’s most unique, engaging, and insightful writers of fiction (and oft-roving troubadour), who passed away in 2011 and is greatly missed. Upheaval from the onslaught. Before. Foolishness as consolation. A handwritten missive as promissory. Less reasoned discourse. A barbarous intimate remittance. A proposal you take frightful. Nothing more then than this. Incessant. Interrogation. A prolonged succession of questions. A frivolity. Your Darling leaves you untouched.